Thinking about getting behind the wheel without a valid driver's license? Have you before? If so, you may want to seriously reconsider what you're thinking or doing. Not having a valid driver's license with you while driving is illegal in any part of US, and you can flip your life upside down if you decide to get behind the wheel without one and get caught. In order to legally drive a car in the US, a driver must have his or her driver's license from the State Department of Motor Vehicles (DMV) or the Stage Registry of Motor Vehicles (RMV) in the state you live in. With this license, you are able to legally drive anywhere in the country. On the other hand, if you don't have a license, you cannot drive anywhere. You do not have a license issued by the DMV or RMV. Your driver's license has been permanently taken away. In different circumstances, the applications of the law vary. If you are driving a vehicle, and you do not have your driver's license on you due to simple forgetfulness, but are specifically asked by an officer to see it, you may get a citation or just a warning from the officer. The majority of law enforcement agencies are able to electronically check on whether or not you are in possession of a valid driver's license. The officer may write you a ticket or may let you go. It may actually be required that you show the physical license to avoid fines. If you're driving without a valid driver's license and get cited, you must appear in court on the designated date. You also have the option of bringing an attorney with you to court on the same date. If you don't have a valid driver's license and you choose to drive, you may be hit with a misdemeanor in many states. If it turns out you are found guilty, you will see it on your criminal record. Each state has different penalties for someone who is found out not to have their driver's license with them. Penalties and fines also vary based up whether the person didn't have the actual proof or if their license is invalid. Often, a first-time offender will have to pay a smaller price than someone who has had this problem before. In certain states, these misdemeanor charges may upgrade to felony charges in those who are repeat offenders. 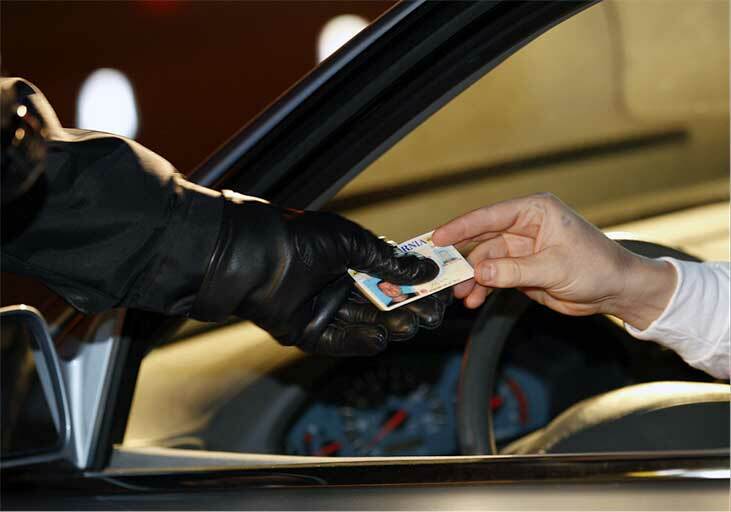 Those who commit a severe traffic offense or DUI may also receive felony charges. In any instance, multiple violations will equal more severe penalties and fines along with higher insurance costs and points on your driving record. Higher fines for repeat violations. Felony charges for repeat offenses or more severe offenses. It's pretty clear that you're not making good choices if you're getting behind the wheel without a driver's license. We all think, "It will never happen to me." Unfortunately, everyone who has ever gotten a ticket has said that before. There are good and valid reasons for carrying your license on you at all times, and doing so ensures you dodge any violations associated with not having it. If you do happen to receive a ticket for anything relating to not having a driver's license, you may be required to take a traffic school course, or you may elect to take it on your own. If you take it on your own, you may have the fines and points of your violation significantly reduced, and it can even lower you car insurance rates. It will also help you avoid future violations that come with even more severe consequences than not having your license.